Weighty Matters: Resolution Series Day 5: A New After-school Activity! Resolution Series Day 5: A New After-school Activity! Day 5: A New After-school Activity! There's no debate, exercise is the single most important modifiable determinant of health. The even better news is that there's really no need for skill - plain old walking works great. Of course that doesn't stop any of us parents from schlepping our kids here there and everywhere for exercise "lessons" - soccer, hockey, skating, dance, the list, and the time involved, can sometimes seem and feel endless. But with all of those after-school sports, is something else suffering? I'd say so. In fact I'd say that perhaps all of those after school skill building activities are actually decreasing the likelihood of parents teaching their children the single most health conferring skill imaginable - the skill involved in transforming raw ingredients into food. The skill of cooking. Cooking is quickly becoming a lost art. With the incredibly fast pace of our lives and world these days, it's no wonder cooking's falling by the wayside. Between chauffeuring kids to their various after school activities, to the electronic tethers we all now wear, time has become more pressured than ever. And of course restaurants of all sorts are everywhere to fill the void. 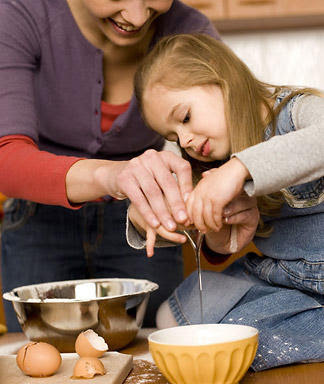 Resolve this year to ensure you teach your children how to cook (and if you yourself don't know how, this is your opportunity to ask them to help you to learn). Find a simple and easy to follow cookbook (like for instance any of the Looney Spoons' books) and book off one night a week as a family cooking night. Each week a different family member gets to take a turn picking, prepping and cooking a recipe. Of course parents can and should help, this isn't about division of labour, this is about sharing and learning the love and joy of cooking. Pick the recipe out on a pre-specified night each week at the dinner table. Ensure you schedule a time to shop for the recipe's ingredients before the day of, and perhaps even prep the ingredients together the night before cooking so that putting things together the next day is a quick snap. Your kid missing one extra after school activity isn't likely to have any negative long term impact on their health. Their leaving your home not knowing how to cook will, as not only will it lead them into the processed food world's nutritionally bereft embrace, it might lead them to lead their future families into it as well. In a sense, your family cooking nights? They're for your unborn grandchildren.